Challenging recent trends both in historical scholarship and in Supreme Court decisions on civil rights, J. Morgan Kousser criticizes the Court's "postmodern equal protection" and demonstrates that legislative and judicial history still matter for public policy. Offering an original interpretation of the failure of the First Reconstruction (after the Civil War) by comparing it with the relative success of the Second (after World War II), Kousser argues that institutions and institutional rules--not customs, ideas, attitudes, culture, or individual behavior--have been the primary forces shaping American race relations throughout the country's history. 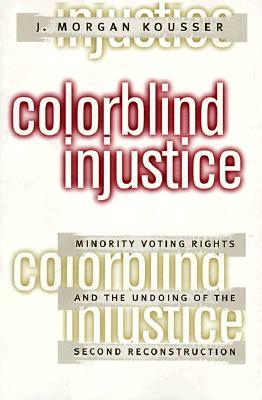 Using detailed case studies of redistricting decisions and the tailoring of electoral laws from Los Angeles to the Deep South, he documents how such rules were designed to discriminate against African Americans and Latinos. Kousser contends that far from being colorblind, "Shaw" v. "Reno" (1993) and subsequent "racial gerrymandering" decisions of the Supreme Court are intensely color-conscious. Far from being conservative, he argues, the five majority justices and their academic supporters are unreconstructed radicals who twist history and ignore current realities. A more balanced view of that history, he insists, dictates a reversal of "Shaw" and a return to the promise of both Reconstructions.